The race for two major new regional airports in northern Norway is on. The price-tag? An astonishing NOK 7.5 billion (€769 million). On February 8, a historic decision was made in the city of Bodø in the far north of Norway, beyond the Arctic Circle. A new airport is to be built, only 900 metres from the old one, which is currently in use by commercial airlines as well as the air force. The new airport has a price tag of no less than NOK 5 billion (€512 million) and will be one of the largest construction projects ever attempted in northern Norway. It will have an annual capacity of 2.5 million passengers and the runway length is 2500 meters, long enough to handle all known aircraft types in operation today. Airport operator Avinor says Bodø today is one of the few airports in Norway that is operated by Avinor to make a profit, the other profitable airports being Oslo Gardermoen, Bergen, Stavanger, Trondheim, Ålesund and Kristiansand. Avinor operates 45 airports in Norway and the annual deficit of the 38 airports requires NOK 1.2 billion in annual subsidies from the government, an amount that comes mainly from the operator’s commercial businesses at Gardermoen. The construction of Bodø Airport is scheduled to start in 2020-21 with the first flight planned to land in 2024-26. A UN expert team has been on site in Bodø to study the project. The Habitat Professional Forum was set up by six million city planning professionals worldwide and is an independent support organisation to the UN. The forum was for the first time ever on a mission north of Hamburg, when a team visited Bodø in 2017. Their feedback was very positive and the Bodø project impressed the experts from the UN who stated it was rare to have the opportunity to experience a new airport to be designed, especially as it gives up space to a brand new residential and commercial area in Bodø. The new airport opens up a shift in travel patterns for passengers and air cargo. As the runway will be 2500 metres long, it will allow long-haul flights to any part of the world, and it is likely some airlines will drop flying via Oslo Gardermoen and instead fly directly to Bodø. 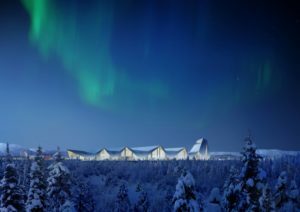 This would enhance the growth of tourism and business in northern Norway. Norway is the world’s leading exporter of salmon and seafood. 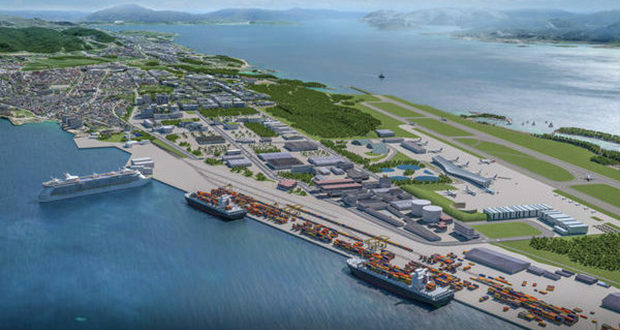 The new airport in Bodø will be a new logistics centre for the region and dramatically cut transport times by road and truck for the region’s salmon producers. They will be able to truck their salmon to Bodø instead of sending it by road to Oslo Gardermoen, saving the environment and reducing the costs of operations. Cargo facilities will get the highest priority at the new airport. But one question remains unanswered: what about inbound cargo to Bodø? The demand is limited and may result in higher rates per kilo of salmon shipped out of Bodø than from Oslo Gardermoen. The new airport will also be constructed and designed to operate electric aircraft, as Avinor has pledged that all domestic commercial flights in Norway will be with electric planes by 2040. Well, time will show if this dream comes true. The airport may get a competitor, as there is another large airport project planned in the same region, Polarsirkelen Airport in the small town of Mo i Rana, located 230 kilometres (by road) south of Bodø, or just 109 kilometres as the bird flies. This airport is projected with a 2200-metre runway and the airport project price-tag is a staggering NOK 2.24 billion (€230 million). The plan is to start construction work during 2018, but Avinor is cautious about this time plan. Two new airports in the same region, total price tag in 2018 NOK 7.24 billion. That seems to me to be a bit over the top, even if Norway holds the rank as the richest country in the world!